Inactive Apaf-1 (left) associates into the active form (right) when it associates with cytochrome c (red). "To be, or not to be"--that question is continually being asked by each of your cells. Your cells are preprogrammed to die on command. This is essential during development of large organisms like ourselves, where cells work together, growing and dying to shape our complicated bodies. It is also essential throughout our adult lives, to remove damaged or infected or cancerous cells. The machinery for cell death is always silently present in cells, but can be instantly mobilized if the choice is made to die. The process of programmed cell death, also known as apoptosis, is highly regulated, and the decision to die is made through the coordinated action of many molecules. The apoptosome plays the role of gatekeeper in one of the major processes, termed the intrinsic pathway. It lies between the molecules that sense a problem and the molecules that disassemble the cell once the choice is made. Normally, the many subunits of the apoptosome are separated and inactive, circulating harmlessly through the cell. When trouble occurs, they assemble into a star-shaped complex, which activates protein-cutting caspases that get apoptosis started. In our cells, the signal that activates the apoptosome is the release of cytochrome c from the mitochondria. 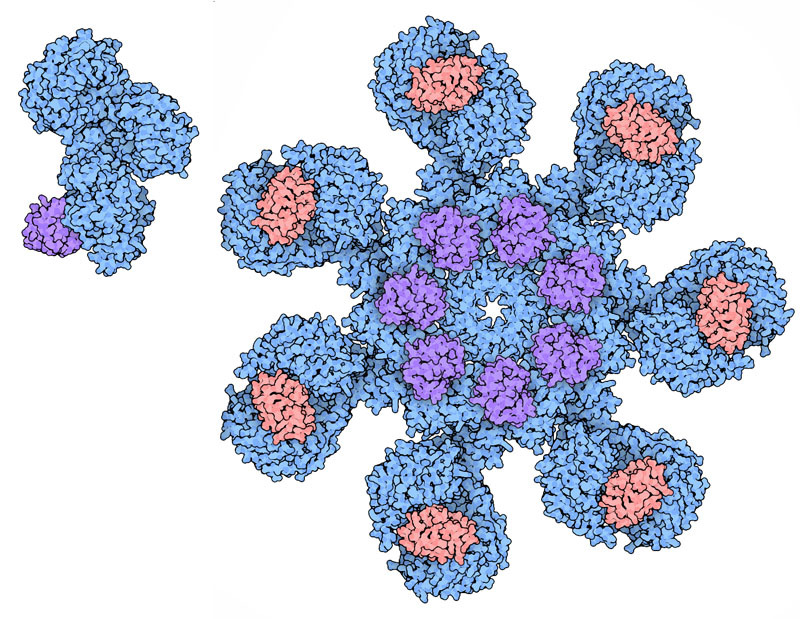 Cytochrome c (shown in red) binds to the protein Apaf-1 (shown in blue and magenta), causing it to assemble into a seven-fold ring. The caspases are then activated by binding to a ring of CARD domains (magenta) on the assembled apoptosome. The apoptosome structure shown here (PDB entry 3j2t ) was solved using maps from electron microscopy, which you can find at the EMDataResource in entry EMD-5186. In the human apoptosome, the CARD domains are connected to the rest of the protein through a flexible linker, and are not included in the PDB entry. They are shown here in their approximate position using a crystallographic structure of the CARD domain (PDB entry 2p1h ). The structure of the inactive monomeric Apaf-1 (shown on the left) is from PDB entries 1z6t and 3sfz . Apoptosome diversity. 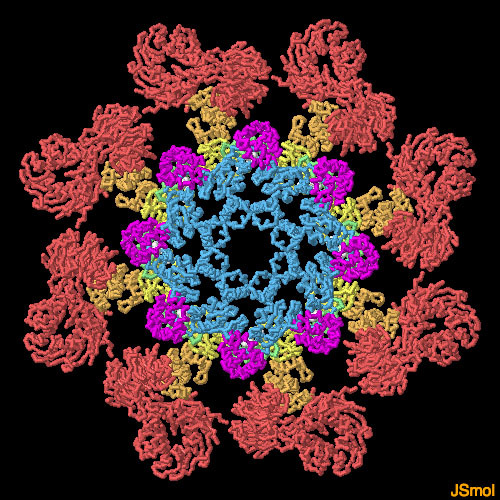 Cytochrome c is in red in the human form, and the CARD domains are in magenta. Apoptosomes from different organisms vary widely in their structure, and how they perform their jobs. The human apoptosome is composed of seven subunits and is activated by cytochrome c. The one from fruit flies, known as DARK (PDB entry 3iz8 ), has eight subunits, and may or may not need cytochrome c for activation. 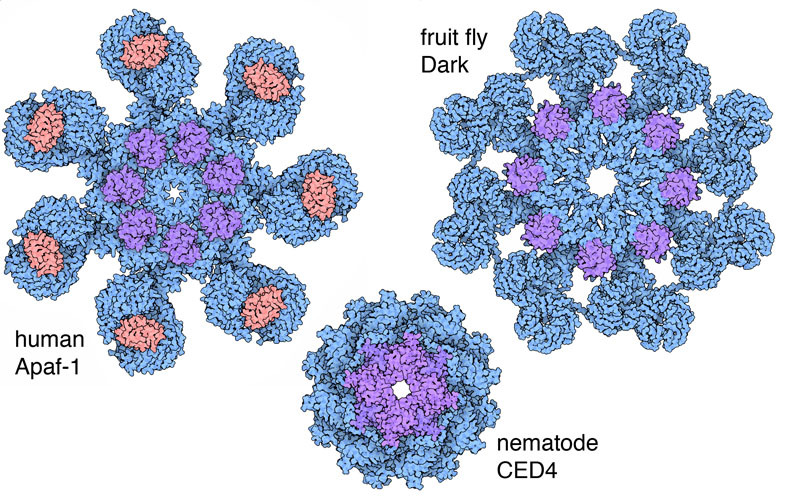 The apoposome from nematodes, termed CED-4 (PDB entry 3lqq ), is much smaller, without the portion that binds to cytochrome c, and caspases are thought to bind on the back side of the ring, not to the CARD domains. Apoptosome proteins are composed of several functional domains, each with a different role to play. The apoptosome from fruit flies is shown here, with the domains in different colors. At one end of the chain, there is a CARD domain (magenta) involved in caspase interaction and a nucleotide-binding domain (blue) that assists with assembly of the complex. At the other end of the chain are two "beta-propeller" domains (red) that grip cytochrome c and trigger formation of the complex. In between are several smaller domains (green and yellow) that coordinate action between the two ends. To explore the domains in more detail, click on the image for an interactive JSmol. The inactive form of the nematode apoptosome is composed of two apoptosome subunits (CED-4) bound to a regulatory protein (CED-9). You can explore this structure in PDB entry 2a5y. S. Yuan & C. W. Akey (2013) Apoptosome structure, assembly, and procaspase activation. Structure 21, 501-515. 3j2t: S. Yuan, M. Topf, T. F. Reubold, S. Eschenburg & C. W. Akey (2013) Changes in Apaf-1 conformation that drive apoptosome assembly. Biochemistry 52, 2319-2327. 3iz8: S. Yuan, X. Yu, M. Topf, L. Dorstyn, S. Kumar, S. J. Ludtke & C. W. Akey (2011) Structure of the Drosophila apoptosome at 6.9 A resolution. Structure 19, 128-140. 3sfz: T. F. Reubold, S. Wohlgemuth & S. Eschenburg (2011) Crystal structure of full- length Apaf-1: how the death signal is relayed in the mitochondrial pathway of apoptosis. Structure 19, 1074-1083. 3lqq: S. Qi, Y. Pang, Q. Hu, Q. Liu, H. Li, Y. Zhou, T. He, Q. Liang, Y. Liu, X. Yuan, G. Luo, H. Li, J. Wang, N. Yan & Y. Shi (2010) Crystal structure of the Caenorhabditis elegans apoptosome reveals an octameric assembly of CED-4. Cell 141, 446-457. 2p1h: S. L. Milam, N. I. Nicely, B. Feeney, C. Mattos & A. C. Clark (2007) Rapid folding and unfolding of Apaf-1 CARD. Journal of Molecular Biology 369, 290-304. 1z6t: S. J. Riedl, W. Li, Y. Chao, R. Schwarzenbacher & Y. Shi (2005) Structure of the apoptotic protease-activating factor 1 bound to ADP. Nature 434, 926-933.